Only just yesterday I decided to write a some daily diary style posts while racing the Tour Of Utah this week. Then, I figured I better do a little warm up beforehand and write something as a precursor to get my writing brain back into gear. So, here we go for that. Currently I’m typing this from a shared University of Utah dorm room in the city of Logan. During my university years I never stayed on campus, so this is quite the unique experience imagining the student life in such close quarters. A little similar to being on the road in a cycling team perhaps. Logan is the town where it all kicks off tomorrow and after a few weeks of high altitude training, travel and tapering I am more than ready to get this party started. For a Utah based team it doesn’t get any bigger this week, and with the recent team name change we really want to make our mark out there. Looking back on the last two weeks I haven’t slept in my own bed too much, thanks to chasing the lack of oxygen at higher altitudes in order to prepare specifically for the climbs of the race. I skipped Cascade Classic for the first time in a long time, instead spending time in Breckenridge and Silverthorne. Much higher than Denver, it was great to not only get the physical adaptions that come from living that high up, but also rad to ride some new loops. After a week somewhat at home in Colorado, it was then off to Heber City, Utah for another mini training camp. This time with a little course reconnaissance mixed in. On the most part the weather was kind and I was able to check out the majority of climbs and key roads in the nearby area. We were fortunate enough to stay up in a remote cabin outside of the city and it served as a great place to unplug before the race madness begins. That’s about all to report. Pretty bland actually. Training, resting, traveling and repeat. Tomorrow the show kicks off so hopefully can make things a little more exciting in the reading department than today. In the meantime, below are a few happy snaps of recent note. Caught snacking at the top of the divide. Getting a little artsy with the camera coming into Salt Lake City. Kaler sporting the new Hangar 15 kits. When you are known only by your home countries National animal, not by name. My new laundry bag. Chad and Steve on a little pre race adventure in the farm roads of Logan. 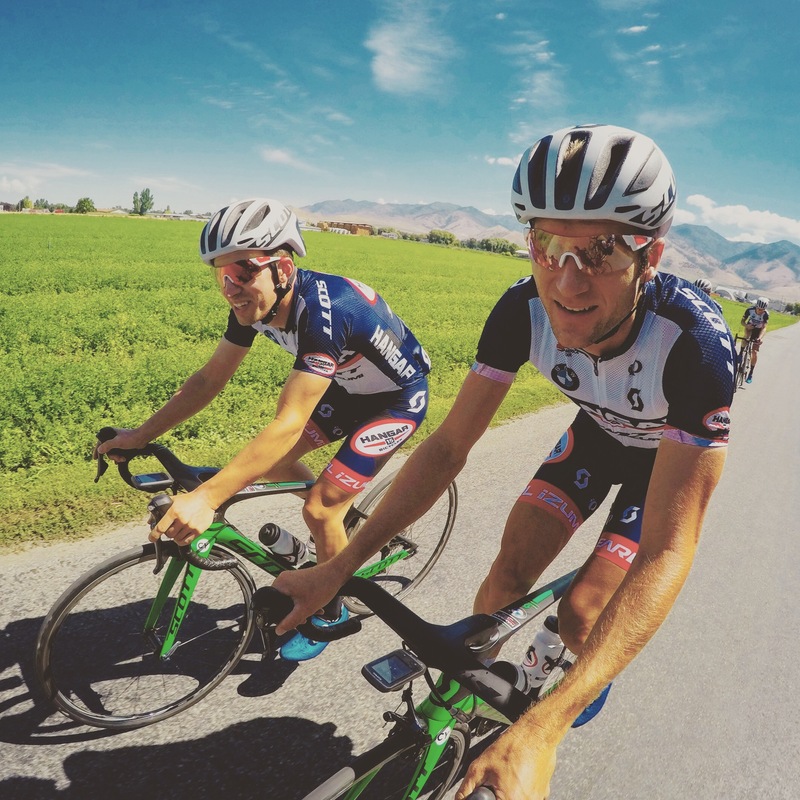 Fantastic to read this article Chris, and hear all about your pre-training for the next race in Utah with your Team. Good luck from all your supporters back here in “Aus” Keep us updated… Good luck to you and the team….